Wholesome natural hypo-allergenic dog food. 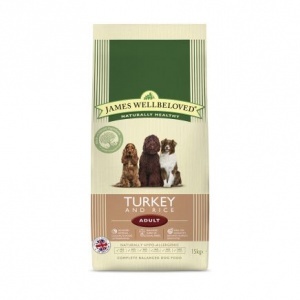 James Wellbeloved Turkey and Rice Large Breed helps loose bowels and calms itchy irritated skin and coat. 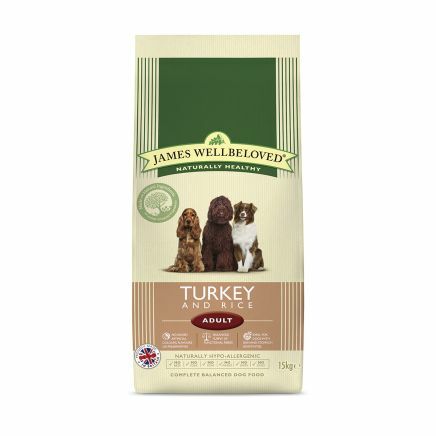 As a white meat the turkey in James Wellbeloved dog food is full of goodness and is very gentle on the digestive tract. Turkey is a better white meat choice than chicken for a hypo-allergenic food because some dogs are known to have already developed a chicken hypersensitivity. A sensitivity to turkey is less likely because turkey is not used as much in pet food so dogs will not have been over-exposed to it.